This Artwork is Available in Several Mediums and Forms, Providing An Affordable Option For All. Edition of Ten (10) Signed & Numbered 3D Lenticular Transparencies Mounted in Acrylic Display with Integral LED Light Panel. Open Edition of 2D Transparencies Mounted in Acrylic Display with Integral LED Light Panel. Signed. Open Edition of 3D Lenticular Prints Mounted in an 28" x 22" an Archival White Matte. Signed. Displayed in the photo below is one of my first production Multi-Dimensional Display Portals, shown wih Modern style corners in Mount Blanc Corian trim (LED panel not shown). All Limited Edition 3D Transparencies come mounted in a MDDP of your design, if you so desire. 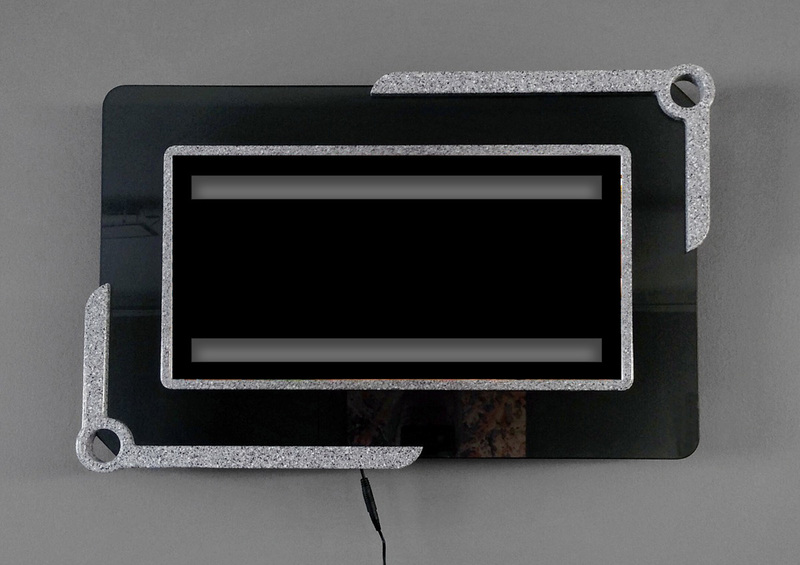 The transparency is mounted on the front of the acrylic surround with a color coordinated bezel made from Corian. A super bright, 5300 Degrees K, 8mm thin, LED panel is also mounted under the bezel, brilliantly illuminating the transparency. The slots are to provide cooling for the LED lights. All that protrudes from the back is the cord, four standoof posts to support it against a wall and a hanging wire. Made almost exclusively of acrylic materials, the image surround and corner trims are made using solid surface countertop materials. The final colors I've chosen are a bone white, a mid gray granite and a black granite-like material with fine white & multicolor specs. For an additional fee we will try to match the trim colors to solid surface materials of your choice. Subject to availability of material for your selected color. Also available without the corner trims. I will engrave the acrylic panel with the title, number in edition and my signature. A 2D Transparency Printed with Lyson Pigment Inks on Epson DisplayTrans Material. Same image, except just a single frame out of the 18 frames (usually frame #9) is selected and printed as a 2D transparency. These 2D backlit images are a great way to enjoy these artworks at a more affordable price. Select your style and color frame at the right or contact us, so that we may help with the customization of your display. Color choices subject to availability. Please allow several weeks to complete your order, the Multi-Dimensional Display Portals are hand-built and customized to your specifications. A 3D Lenticular Reflection Print, which has been printed on Epson DisplayTrans film with archival inks and then laminated to a 40 LPI lens. The print is placed in an Archival 28" x 22" Matte, Ready for Framing. Just Looking for Something for Your Wall, Not Necessarily a Potential Collectable? You can have a 2D reproduction of this artwork printed on your choice of 7 papers, canvas, metal, or acrylic. If you wish, you can also have it printed on a phone case, t-shirt, pillow, tote bag, beach towel, shower curtain and more.